High speed sawing of ferrous plate materials. Precision cutting up to a 4” thickness. Position tolerances of ±.007” on every cut. Heavy duty backgauge design for big jobs. 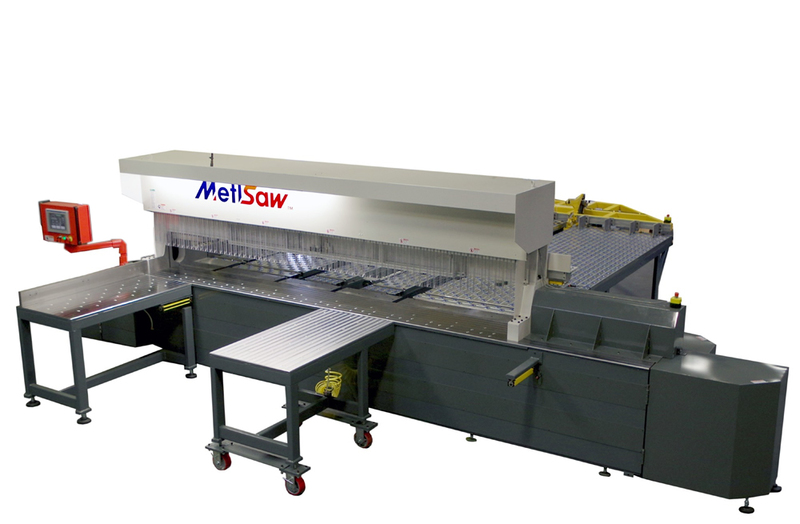 MetlSaw’s F Series is the world’s leading plate sawing machine for cutting titanium, carbon or stainless steel, and other ferrous materials. Cutting windows range from up 2’ to 20’, and are capable of cutting materials up to 4” thick. 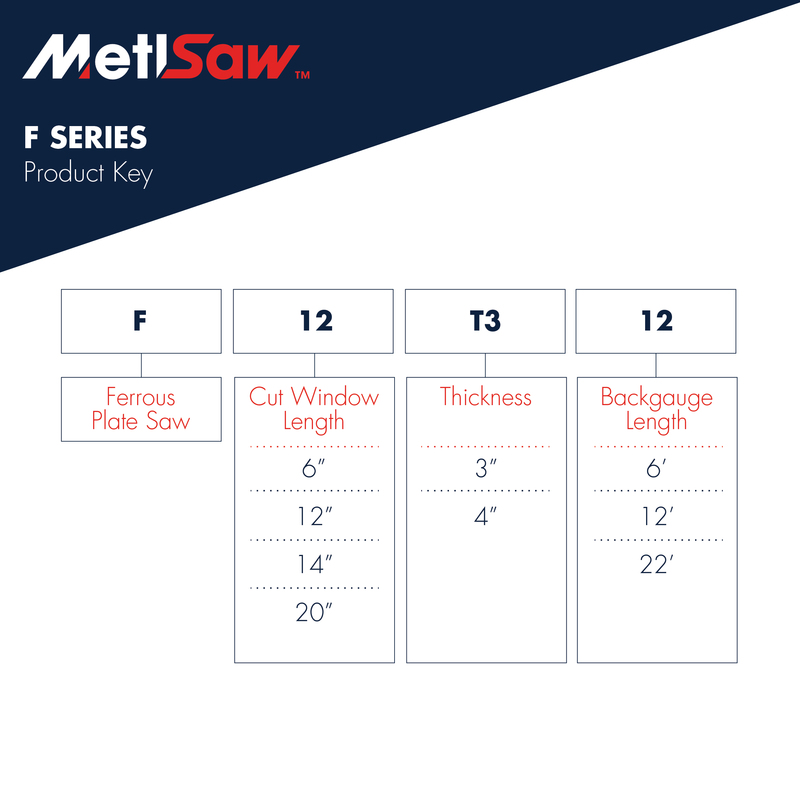 The F Series plate systems offer tremendous power and versatility, and MetlSaw professionals work directly with customers to ensure they purchase equipment that is configured to meet their unique production needs. All F Series saws use a powerful 50 HP Arbor motor with a large gear reduction providing an impressive amount of cutting power. They also come with factory-automation design features that make the equipment the top choice of service centers around the world for enterprise-scale sawing operations. 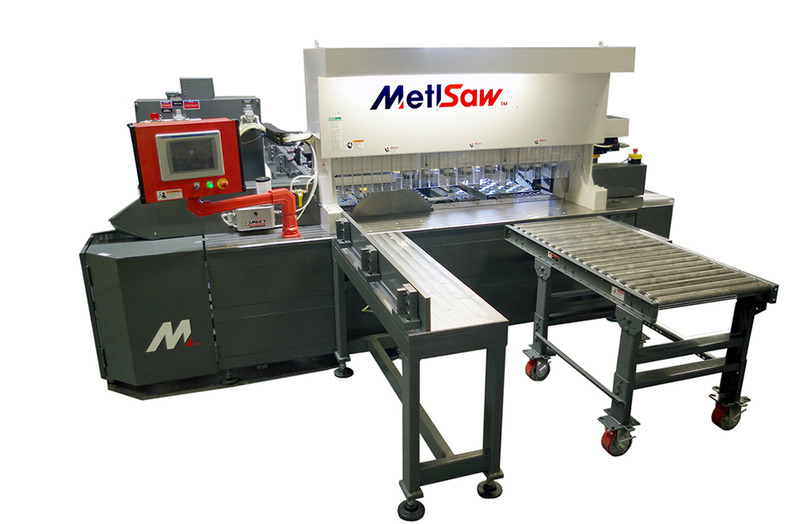 MetlSaw offers four F Series sawing machines with large cutting windows for expert handling of thick or long plate materials. The tough backguage design features allow operators to load materials more easily. Materials are precisely positioned to hold thick materials to even the tightest of tolerances, yet the system is easy for operators to learn and manage. The Metlsaw backguage configuration makes it easier for an operator to move even the heaviest, thickest plate through the saw. The upgraded control system software retains memory of specifications for up to 1000 parts, for rapid job staging and high efficiency. The F Series saws can also be easily serviced and maintained. Supports surface finishes to 16 micro-inch. Precision tolerances to of +/- .007” or .177mm delivers high level of cutting accuracy. Precision tolerances to +/- .007” or .177mm delivers high level of cutting accuracy. Precision tolerances of +/- .007” or .177mm delivers high level of cutting accuracy.